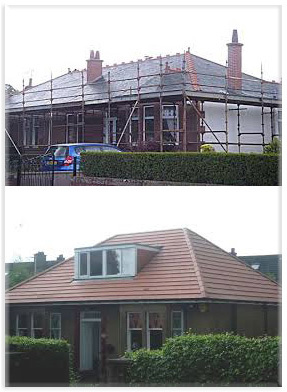 Norside has built up a reputation over many years as being one of the main roofing companies in the West of Scotland, serving both the public and private sectors. We thrive on being able to deliver a good service whether it be one slate missing or renewing a whole roof. Every project large or small is treated with the same level of importance. Tiled Roofs – concrete and clay tiles. Pitched Roofs – convert from flat to pitch. Slate Roofs – Scotch, Welsh and Spanish. Chimneys – re-lead, re-point, roughcast and render. Guttering – re-new, re-sealing, re-alignment and painting. UPVC – Fascias, soffits and guttering. Cladding – Timer or UPVC. Lead Work – All aspects. We believe in recycling and hold one of the largest stocks of reclaimed Scotch and Welsh slates in Scotland.